Over the last decade, the role of the CMO has evolved considerably. Once a marketing-centric role that entailed stewardship of a brand, this job description has been completely turned on its head thanks to the emergence of digital technologies. In the past, a CMO might have been tasked with duties in advertising, brand management, loyalty-building, and market research. But due to the emergence of modern technologies and user-generated media, the role is much more complex. Today, everything can be quantified, measured and understood in great detail. This has given the CMO a sharper revenue-generation focus, with the goal of sourcing leads and demonstrating ROI. He or she must be willing to step outside their normal routines, in order to win over audiences. The shift in a CMO’s responsibility also brings about the need for a more comprehensive solution: mobile apps and mobile customer experience programs. To understand why, however, we must first consider how the average CMO fits into the customer acquisition process. The way a company crafts its customer experience has become a linchpin to revenue generation, as well as integral to the CMO’s new role. Consumers expect a more open relationship with businesses than they did in the past. A company that doesn’t satisfy this demand risks falling behind. The modern CMO, armed with a CX mindset, enjoys a considerable advantage when it comes to developing a genuine, transparent connection with customers. But what does it take to nurture a cutting-edge customer experience? The answer lies in digitization - especially mobile technology - the same force that changed CMO’s roles to begin with. As of 2016, about 45 percent of small and medium sized business owners believe a digital presence is extremely important for their success. It is important to establish the objectives of the CMO to understand how CX and mobile opportunities fit into the equation. Of course, there isn’t a single “right way” to achieve all this. There are, however, incredibly lucrative tools to achieve such a thing, mobile experience programs being an obvious solution. 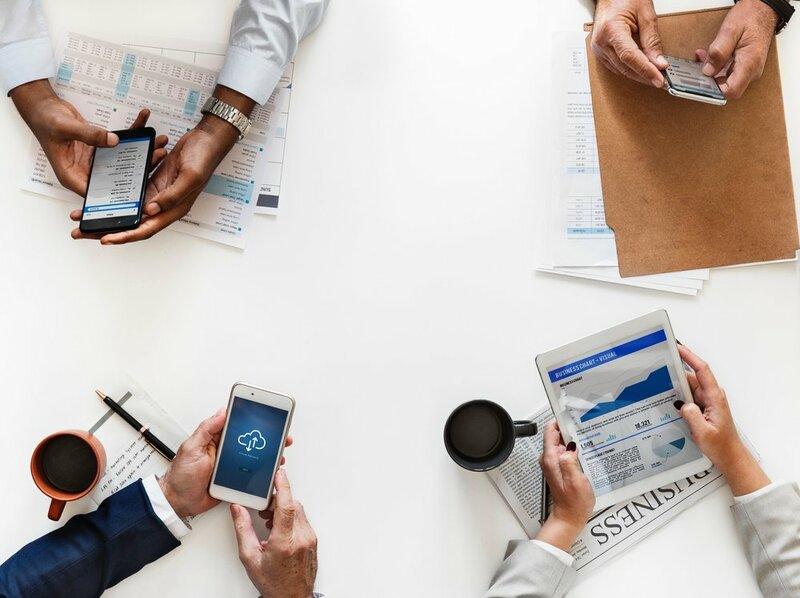 Modern technologies have completely changed the way both businesses and individuals connect, share, shop and make decisions. Everything from AI and machine learning to mobile messaging is being used to reshape the average experience. This generates something called a “revolving tech door”, where the world is in a constant state of change. CMOs will find it difficult to keep up with such changes sans the robust tools available on mobile. 75 percent of marketers and 85 percent of IT professionals report that mobile is a definitive part of their company’s customer experience journey. Mobile — mobile apps especially — are the solution for coping with many of the changes brought forth by the revolving tech door. CMOs specifically can leverage mobile insights to inform and hone their customer experience programs. On-the-go, instantaneous experiences with a focus on real-time sharing are more sought after than ever. This kind of access creates value through convenient features. Think of being on a Skype call with your team while simultaneously collaborating on a presentation in Google Drive. Features such as these ensure that teams can keep up with the constant shift of business touchpoints. “Wow!” micro moments are also an important consideration. These tend to be more abstract, more impactful stages of the customer lifecycle. What truly inspires and impresses your customers? What makes them immediately want to spread the word on social media ? Of course, disparate elements such as branding, social and product features come together to form these powerful moments. Furthermore, these moments allow organizations to personalize an experience, delivering something remarkable to their audience. Maureen Sullivan, COO for Rent the Runway, explains how “any interaction” with their customers is “an opportunity to really deliver a more customized experience.” From product searches through a mobile app, to customer support chats on-the-go, these engagements offer a chance to delve deeper into a customer’s preferences and needs. Finally, we have the ‘being smart’ aspect that comes along with connected, more aware technologies. An increase in data and in the value of said data means better, more accurate experiences that garner remarkable success. "The modern CMO, armed with a CX mindset, enjoys a considerable advantage when it comes to developing a genuine, transparent connection with customers. @TheCXApp"
So, why are mobile customer experience programs such an ideal fit for CMO objectives? For starters, it’s about more than just the app; it’s about delivering customer experience as a service. One centralized app affords accessibility to all high-level features at any time, anywhere. This persists across internal or external solutions. Elements like market research and analytics, strategic marketing, intuitive user experiences, personalization, and multi-level feedback are all available via mobile. Imagine taking all the disparate systems that you use to conduct your work and mashing them together under a single interface. That’s exactly what you can achieve with a mobile app. Everything is possible, from delivering a positive customer experience, to collecting user data or simplifying communications with employees. 42 percent of customer service agents are unable to efficiently resolve issues due to disconnected systems, archaic user interfaces, multiple app portals, and just all-around frustrating experiences. So, the centralized nature of one app benefits more than just the CMO — it helps everyone within in organization. There are many ways to deliver a mobile app experience, but a SaaS solution helps mitigate excessive costs. The off-location nature of SaaS also provides key tools right ‘out of the box,’ without the usual on-boarding period that comes with installing new systems. Ongoing support and integration with other tech provides an up-to-date and feature rich toolset with little to no hassle. Alternatively, you could build an app in-house using your own IT and development team. This would allow you more control over the design. However, building your own app would increase resource costs significantly; the additional time necessary to find skilled professionals who can build and maintain the software is not the least of them. Comparatively, SaaS solutions are turnkey, eliminating a lot of the risks from conventional native platforms. The beauty of mobile apps is that they inherently know who we are, where we are, and what mindset we’re in at the time of engagement. So, the more we interact with brands, content and social experiences the smarter the tools become — merely because of the data flowing in. For businesses, this translates to improved and more personalized customer experiences that align with customer interests. Mobile generally interfaces with a variety of other platforms, including IoT and smart technologies. Devices like smart appliances and smart home tech, wearables, and cross-platform tech present limitless opportunity to leverage data and better shape future experiences. Google Chrome and Android users, for example, take their browsing history everywhere they go, even across desktop, mobile and other platforms. This is in addition to the mobile features that you can access such as text and push notifications, instant messaging chats, and on-the-go social platforms. Considering most CMO’s allocate 9.2 percent of their total marketing expense on analytics, mobile data serves as a true opportunity for growth. The key is not necessarily what types of data are accessible, but that the information is reliable, up-to-date and organized. Let’s say the CMO wants to take mobile usage trends and apply those to future customer experience programs. Market research is one of the core duties of the CMO; luckily, mobile app data can help tap into the active side of the market. What features and support are customers most interested in? Which past engagements worked and which didn’t? What Do Mobile Apps Really Do for the CMO? Mobile apps naturally bring together valuable sets of experiences, data from customer sentiment as well as net promoter scores and new technologies. This enables more quantifiable intel for the CMO, which can be rolled into brand growth and customer loyalty efforts. Targeted data — specifically about how customers are engaging with a brand — are exactly the kind of insights that can turn a questionable CX campaign to a successful one. Beyond that, mobile will positively impact company ROI because of diminished spending on disparate systems. Market research and analytics, customer experience tools, promotion channels and management insights all become accessible in one place. Today’s CMO can definitely use the kind of support that your average mobile app experience offers.